The much awaited Beat of Lagos 2015 concert has gotten a nod from the Lagos State Government through its Ministry Of Tourism and Inter-Governmental Relations. The concert which was headlined by; P Square and several other A-list artistes at the maiden edition in 2011 have also had several top acts performing on its stage since inception, Tuface Idibia, Wande Coal, Skales,Eldee, Yemi Alade, Burna Boy, Solidstar, Skales, Dammy Krane, Iyanya, Dr Sid and Lynxxx, Durella, Sheyi Shay, Tillaman,AjebuTter22, Jaywon are some of the artiste that has thrilled guest at the concert. Last year, The “Beat Of Lagos Award” was introduced, an award that saw Lagosians voting online for the song that kept them dancing the most all year round, hit single from the Mavin’s Crew “Dorobucci” went home with the prestigious award . 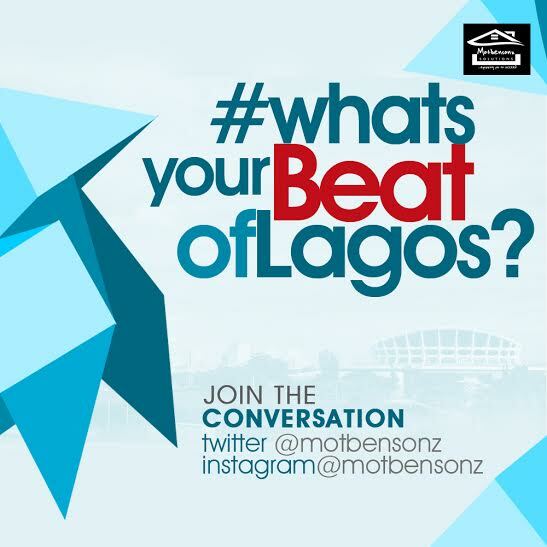 According to the CEO of Motbensonz, OmoToye Benson he said; “Beat of Lagos” concert provides an atmosphere for networking and also serves as a timeout to celebrate entertainment icons and songs that has kept us dancing the year round. Beat of Lagos 2015 will see a command performance from it’s official talent sponsors; Chocolate City Records, a label that boast of acts like ; MI Abaga, Iceprince, Jesse Jagz, Ruby Gyang, Victoria Kimani , Dj caise and a host of others. The event is billed to hold in August 2015 and is supported by Cowbell Coffee and Buttermint .